A toasted bagel slathered with cream cheese is such a happy breakfast for me. I know it's a lot of carbs, but once in a while I like to buy a big bagel and just savor it. 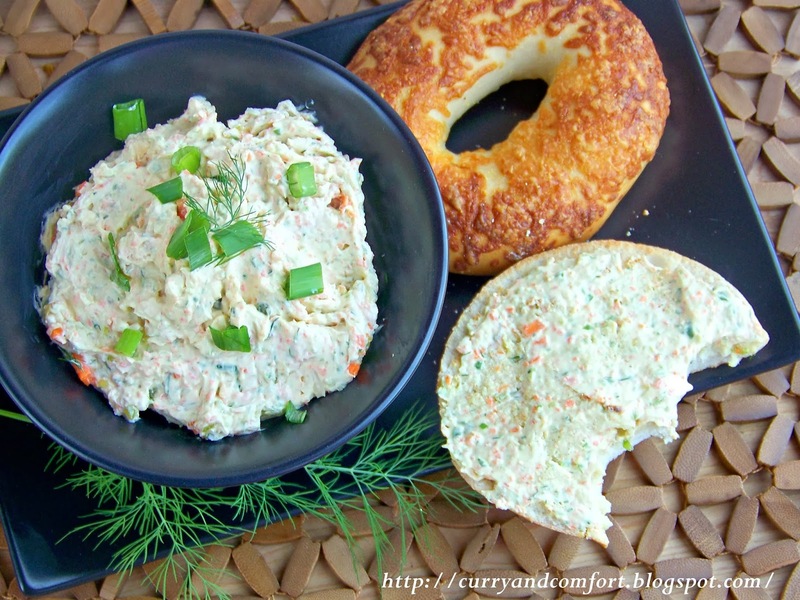 My favorite cream cheese on a savory bagel is vegetable cream cheese. I'm frugal so I don't like to pay for the pre-made version that usually costs twice as much as the regular cream cheese for a smaller tub. 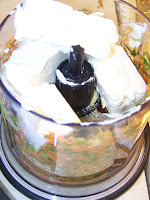 It takes almost no time (if you have a food processor) to make your own version of vegetable cream cheese. I made mine extra spicy by using an anahiem pepper instead of a green bell pepper. 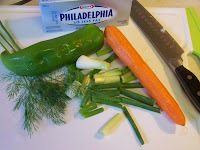 I loved the spicy kick I got from the pepper and all the fresh flavor from the vegetables and so did my little daughter. We have both picked out our bagels for breakfast tomorrow so we can enjoy this yummy vegetable cream cheese again. incorporated. Serve with bagels. Enjoy. PS....She wanted everyone to know that this is kids play food so it's just for playing and not really eating. I love love love bagels...they are really addictive:)) and your spread sound yummy! I see RR there in the future from your description...how adorable of your daughter! Aww Ramona how cute is that? Did you show her the photos on your blog? I lovew the veggies that you added to the cream cheese, looks delish. Have a wonderful day. I applaud you for coming up with your own cream cheese spread...much more natural and without a doubt more delicious. What a cute tea set! This is a fantastic way to add a homemade twist to make breakfast extra special. That bagel looks super delicious. Aww! Your daughter's set totally crack me up. I have a 4 year old and I can totally relate to you! Well I don't bake so what she prepares is like fish and meat with veggies... more like regular meals. LOL. She knows I'm not a baker! I love your spread. I've never made spread using cream cheese. I even didn't think of that idea. Great idea!! I can imagine her getting cream cheese all over her face - awww! I look forward to watching your daughter's cooking show in the future. I also would enjoy your cream cheese spread on an everything bagel. Making a veggie spread is such a good idea. Not only do you save money, you have the vegetables you want in the spread. It must be fun pretending with your daughter. I LOVE this recipe. 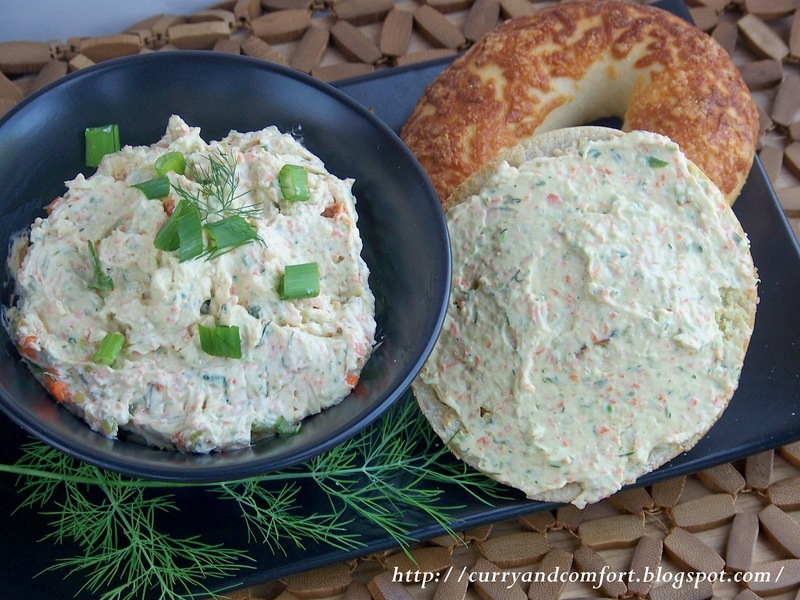 I have a girls' weekend in a few week and may whip up a batch with some vegan cream cheese. What a great idea and I loved your daughter's version. So cute! This looks great and easy! 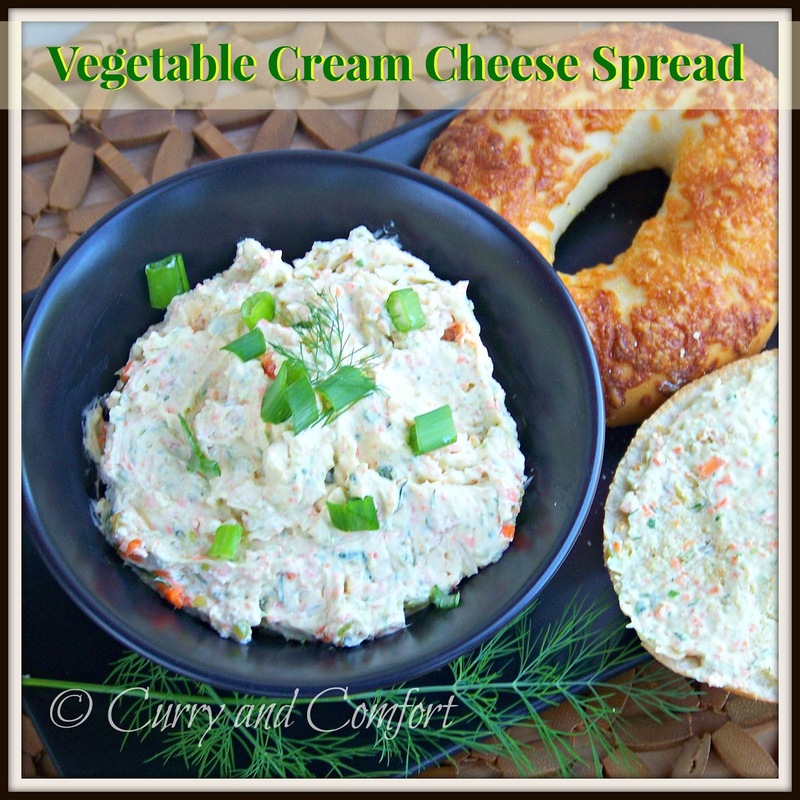 I normally like plain ol cream cheese, but I'll have to try this! What a great cream cheese spread. 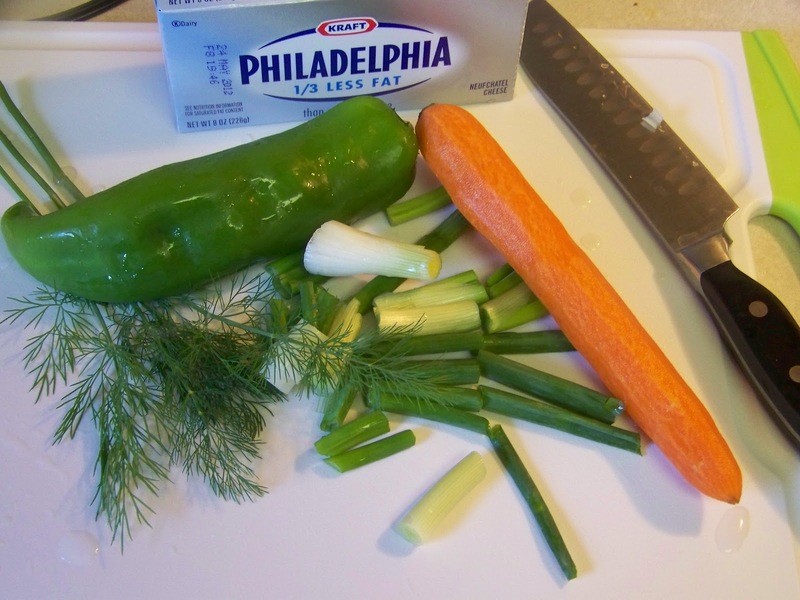 I love putting the veggies IN the cream cheese! Your daughter's photo composition is better than mine! Looks like the two of you had a blast! Great minds indeed! And why pay for something you can make yourself! (Un)fortunately there are a few things I can’t eat. Or well, don’t like to eat (in unprocessed form) which is butter, cheese and milk. 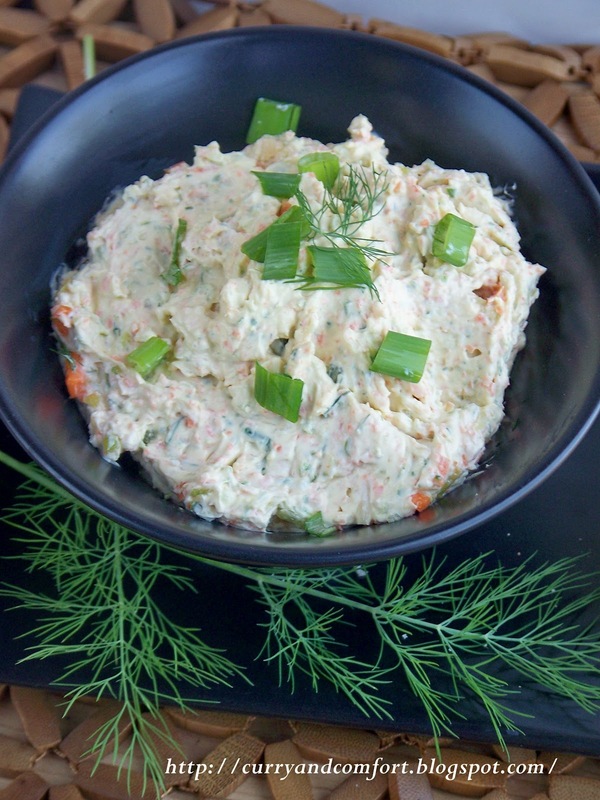 I’m slowly getting use to garlic herb butter, so who knows…maybe one day I’ll be eating cream cheese as well! But I’m sure my hubby would love to have his on his bagel. Good to see that your little girl is enjoying cooking with mommy! 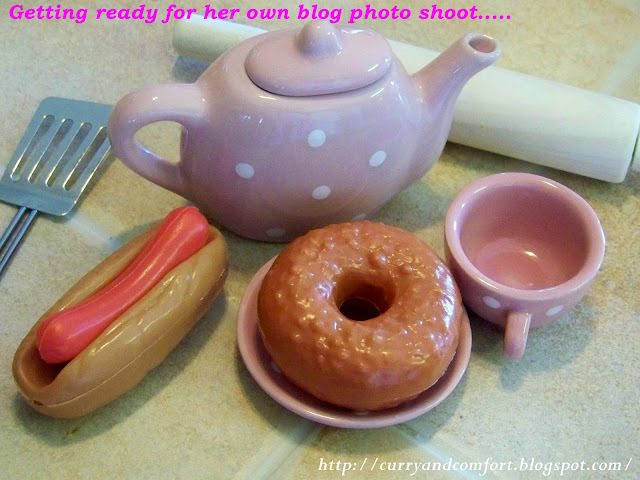 Great recipe and great photo of playing with real and toy food. Mini-me had a play kitchen. I loved it as much as she did. what a great idea to make your own! sounds good!